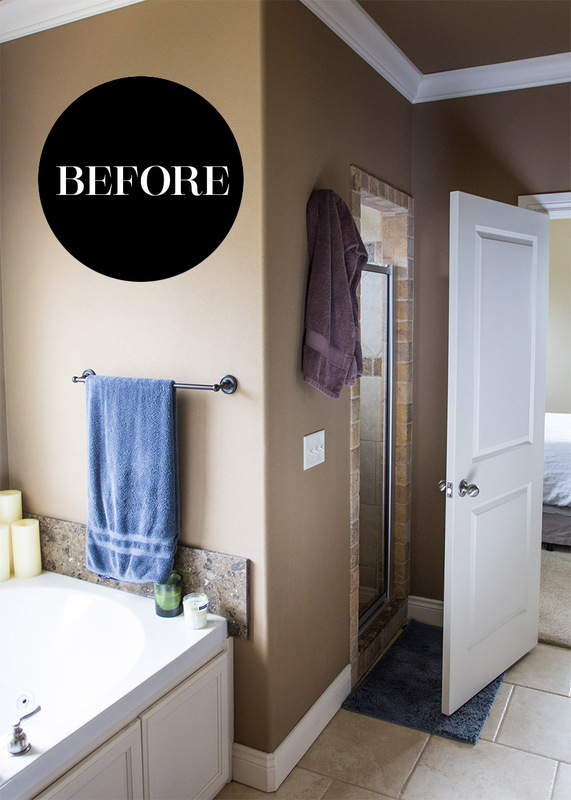 I knew I wanted to remodel my bathroom and open this dark and dreary space up, creating a light and airy, spa-like experience. My inspiration began, perhaps unknowingly with a Marilyn Monroe print that I purchased in a London art gallery six years ago. I could never find the right place for her in my house, until now. I’ve always had a love for the black and white glamor of 1940’s Hollywood. So, using Marilyn, and other stars as my inspiration, I created a design built around black, white and grey, courtesy of Sherwin-Williams. Before the remodel, the door from the bedroom to the bath opened into the shower so to get out of the shower, you'd have to push the bathroom door shut. I decided to remove the door all together. 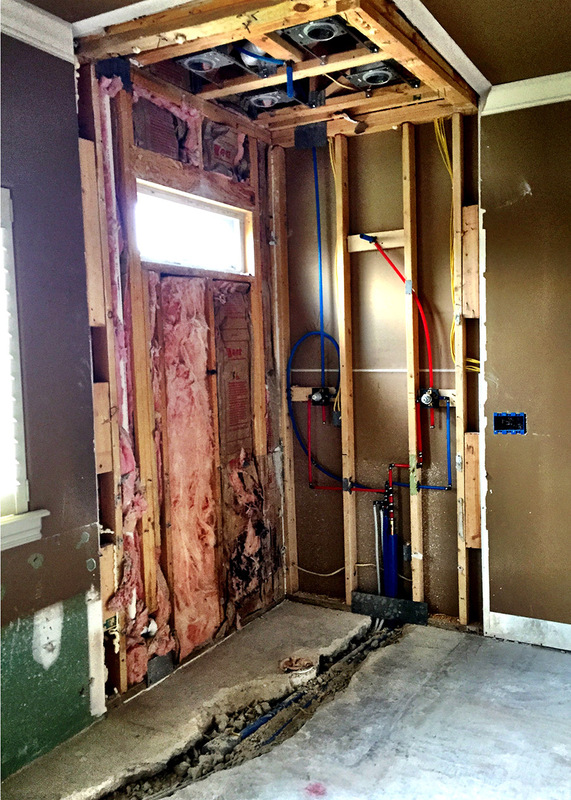 I considered a pocket door but the shower plumbing would've prevented the install. I decided to do a sliding barn door instead and I'm so happy I did! This door and door kit is from Rustica Hardware Door Company. It was really simple to put together and fairly simple to install. The new floors are ceramic tile that are a dark charcoal, woodgrain pattern to resemble hardwood. LOVE. I had the shower enclosure custom-made out of steel. It was built in two pieces with a transom above the door. 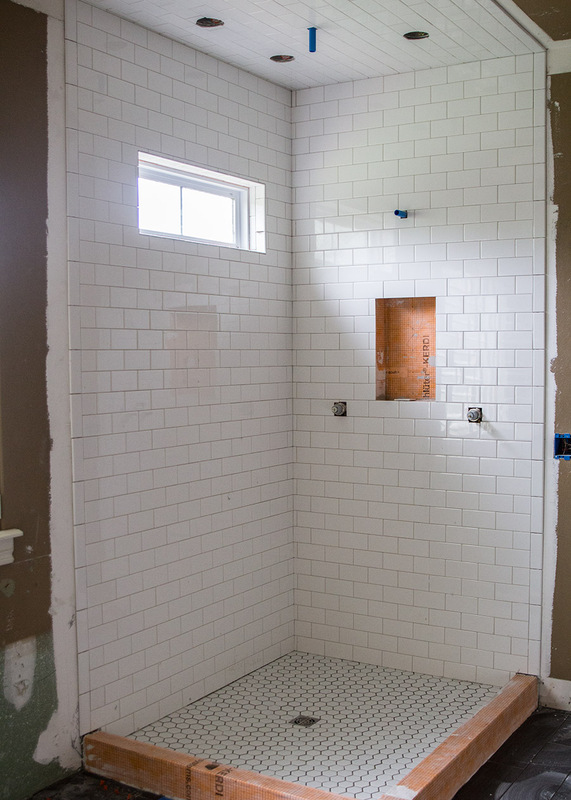 The panes are on the OUTSIDE of the shower and solid glass was mounted on the inside for easy cleaning. The steel shower frame above before getting painted black in a satin finish. I repurposed the hexagon floor tile behind the built-in shower cubby shelf. I also chose this Delta shower head and trim kit to tie back to the bathtub hardware. The bathtub and hardware shown below is from Rejuvenation. • Duckhorn 2012 Chardonnay (Napa Valley), to go along with your bubble bath of course! Permission must be obtained to republish/repost any and all images.